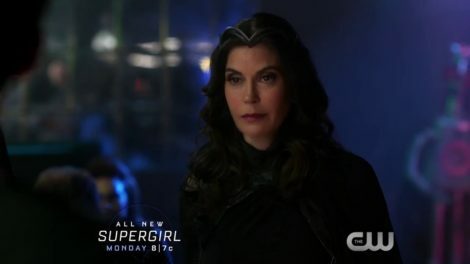 Last week on Supergirl saw Kara navigate the fallout from the reveal that Mon-El is not actually a Daxamite palace guard but rather the lost prince himself and the arrival of his parents, King Lar Gand (Kevin Sorbo) and Queen Rhea (Teri Hatcher) to bring him back to “make Daxam great again.” Subtle, this show is not. 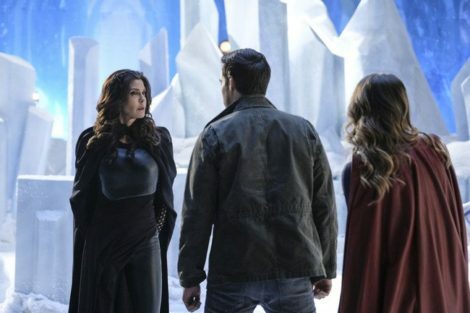 That episode ended with Kara breaking up with Mon-El because she couldn’t handle all the lying but one really fun musical crossover with The Flash later and they’re back on good terms going into today’s episode, “Distant Sun.” So good, in fact, that Mon-El is busy making Kara breakfast in bed, only for her to take off to stop an alien blowing up a park with laser eyebeams. Taking him out and bringing him to the DEO, Kara learns that this guy is one of several alien bounty hunters who have come to Earth for a huge bounty placed on Kara’s head. Suspicious, Mon-El arranges a meetup with his parents at the “alien bar” (seriously, still no name) to see if they had anything to do with it but they deny it. Meanwhile, Alex and Maggie run into Emily, an ex-girlfriend of Maggie’s, which brings up all sorts of uncomfortable stuff from Maggie’s past. 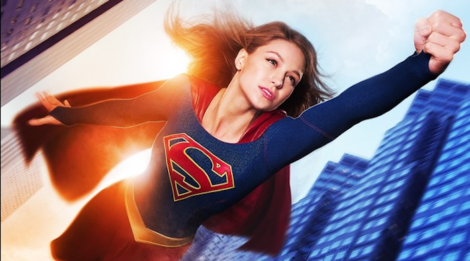 Kevin Smith returns as director again after “Supergirl Lives” and acquits himself a lot better. Smith’s skill as a director has always been in the realm of character beats and conversation rather than outright action and that remains true here. Writers Gabriel Llanas & Anna Musky-Goldwyn turn in a script that helps emphasize that element and, for the most part, it works really well. The actors of course are firing on all cylinders. Chris Wood nails Mon-El’s redemptive arc and emotional transformation really well and Teri Hatcher morphs from concerned mom to uber-evil villain at the drop of a hat which is great; seriously, at one point, she wields Kryptonite-laced sais which rules. For me, though, the surprise MVP was Kevin Sorbo as Lar-Gand. I’m not familiar with his work as Hercules but Sorbo equips himself very well here and it’s a pleasant surprise to see. If this is the last Supergirl episode we get for an entire month, then it’s a good one. Solid fight scenes, good character beats and a compelling story prove that what makes this show great is the sum of its parts.